A useful reference to B owners who like to tinker a bit with their cars as the page contains the basic maintenance requirements, schedules and links etc. Gallery of MGB cars: click on the model / series to view the gallery. Click here to view the data base of the MGB and RV8 Register, based upon the information provided to 24 Jan 2019. The list is to be a comprehensive schedule of all such vehicles, be they under historic registration, modified road or racing. The website also includes profiles and photographs of individual's cars, categorised by model, hence if you wish to have your vehicle profiled under these categories then please email me a photograph plus any other relevant details. We had been kindly invited by Daryl Bowler, the Managing Director of Willshire, to visit his motor trimming and auto fit out facility at Richmond. We were greeted by Daryl with some beer as he gave us a very comprehensive talk on Willshire before conducting a tour of his facility and an inspection of the vehicles currently in the ‘shop’. Willshire was started by Don Willshire in 1955, the business then being taken over by his son. Since then there have been two more owners with Daryl purchasing the business some 10 years ago, being at the present premises, on Deacon Avenue for the past 5 years. The premises were previously used by Hyde Park Press and was where John Roach worked. Daryl has grown the business to probably the largest of its type in the State, going well beyond being just traditional motor trimmers and now employs 15 staff, 9 of whom are in the workshop. Of the staff the longest serving employee has clocked up 32 years, with several others close on his tail. Traditional motor trimming still accounts for some 40% of their work, with the remainder being new vehicle fit out and modification, with extensive work in disability access. A large part of their work is for government and authorities, such as prison vehicles, St. Johns Ambulance for whom they are contracted to fit out 40 ambulances, and local council courtesy buses etc. Often they are called upon to fit out a brand new car, say where leather seats are preferred. They are fully licenced to undertake and to self-certify all such works. The disability access work extends well beyond the traditional bus access lift platforms, to fully integrated access and ride safety systems. We were given a demonstration of a Swedish “Car Seat” which sits as any other passenger seat in the car, ie; it utilises the same seat belts and has the same air bag protection, but is fully programmable to self-lower from the car onto a wheel chair chassis, so eliminating any manual handling. For the disabled driver, Willshire can install all the necessary vehicle control systems. Projects that we saw included a full internal fit out of a magnificent 60’s Ferrari 330GT and of a very nice Karmann Ghia, mobile homes, ambulance and various community buses. So if you need any internal work done to your vehicle you’d be mad not to speak to Willshire. and many thanks to Daryl for his time, for his interesting and detailed briefing and for his hospitality. Saturday 21st July 2018, by Steve Spong, photos by David McNabb - to view click here. 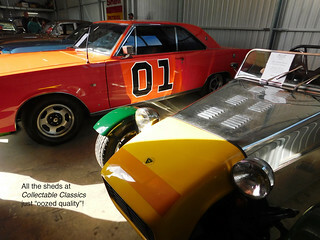 We had been kindly invited by Collectable Classics to visit their new show-rooms in Rankine Street, Strathalbyn. 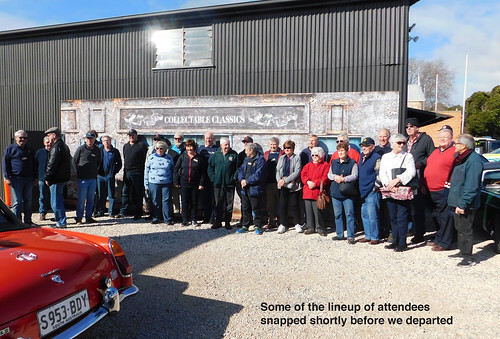 Ben Finnis and Collectable Classics are long time supporters of the MGCCSA, often sponsoring our major events, and so it was great to see some 50 Club members readily take up the invite!, especially given the wet forecast which luckily did not eventuate. So thanks to all who came and my apologies if I missed you signing on. The event attracted some new and recent club members, plus previous member Chris Hunt in his BGT who was back in Adelaide for the weekend. 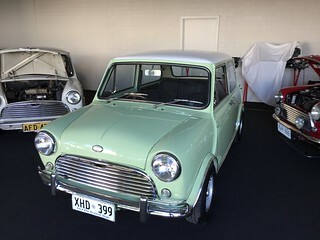 There were two Mini Coopers in the run, with David Evens and son Jack in their recently acquired Cooper S, plus Leigh Albertson in his recently restored 1970 Mark 2 Cooper S.
Leigh bought the car in Melbourne in 1986 and had it resprayed from orange back to the original and rare factory Tamarisk Green with a white roof. The car then followed him in his moves to Tasmania and to SA, when in 2015 he decided to have it restored to its original glory. Having only just taken back possession he was proud to bring it out on its first proper run. It looks terrific! Some made their own way directly to Strath, however about 15 cars set out from Veale Gardens and headed through the Hills, where the "conga" line was joined in the Eastern Suburbs, in Summertown and again was lengthened as we drove through Mylor. Unfortunately Olly Wegner's car broke a drive shaft as he pulled up in Summertown, so he got a lift the rest of the way with Nick Micklem and had the car towed home later. 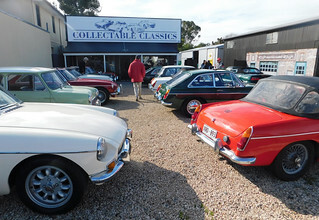 We were met at Collectable Classics by Ben Gillespie and directed into their car park where some 20 to 30 cars were crammed in, causing much interest in the town and resulting in the visitor numbers swelling even further. After coffee and biscuits we all explored the various buildings and admired the huge and varied range of highly collectable cars, and bikes. I'll let the photos speak for themselves, from David McNabb - to view click here, and the website (www.collectableclassics.com.au) is well worth a look. Ben Finnis welcomed us all and gave an overview of the facility, outlining his aims for the business including developing further the motorbike section, and even invited us to a private viewing of some locked away cars. Ben in fact threw open a general invite to all Club Members to visit his display any time when in Strath. All in all we could see their passion for the cars and would like to sincerely thank Collectable Classics for dedicating so much time to us. Following 2 stinking hot days, the weather finally started to cool down on the Sunday evening in time for our little Beach Run, in fact it even tried to rain on us during the drive, but nothing to stop the tops from staying down. Unfortunately Bruce Martin retired along the way, but he had been having some car troubles recently, however the rest of us arrived at a busy Largs Bay after a pleasant run in convoy along the coast. Upon arrival we were greeted by 2 members of the MG Car Club of Victoria, Brendon and Heather who were holidaying in Adelaide from their farm near Shepparton. 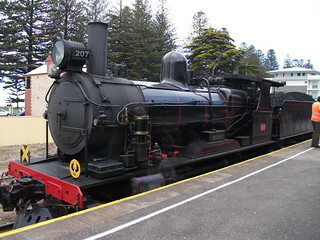 They had seen the run advertised on our Web Site and so decided to visit Largs Bay for tea and to see the cars. So many thanks to them for making the effort and for staying to have a bit of a chat. Thanks to those who came, and I trust that you enjoyed the run and made the most of your time in Largs afterwards. 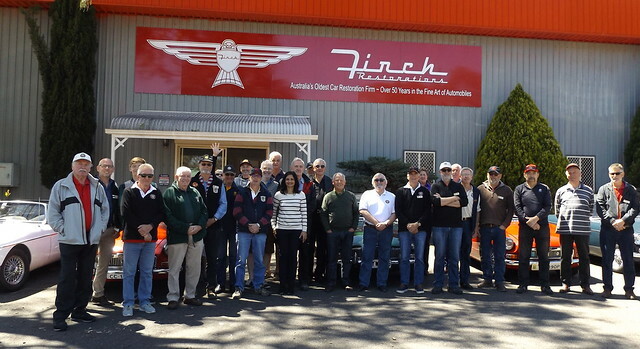 It was a perfect spring day for our visit to Finch Restorations at Mount Barker, where we had kindly been invited by Peter & Harbinda Roberts, to visit their facilities which they had purchased 3 years ago. Finch are the oldest, and probably the largest, vintage and classic car restorer in the country. They can undertake coach building, interior fit-outs, plus mechanical works for cars, trucks and even motor bikes. They offer a full service from minor dings and body repairs or just routine serving, through to full ground-up restorations and mechanical rebuilds. 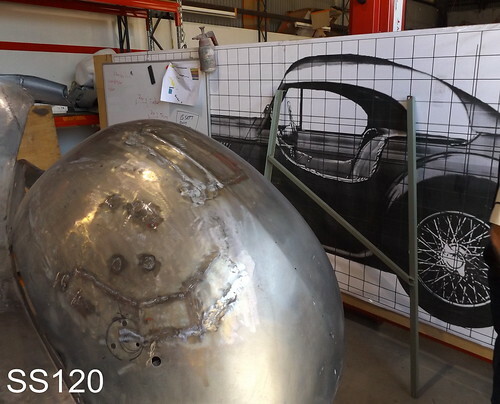 They will even build a replica for you if you want! We were welcomed with coffee and then given a detailed tour of their premises by Peter, where he gave an account of every vehicle that they are currently working on (some 2 dozen) and described the wide ranging scope of the works involved. One project was the reconstruction of a very rare front wheel drive Alvis two seater sports car (circa 1930) that was being constructed from an artist's rendering of the time, as detailed technical data was simply not available (refer photo). They have also undertaken an in house project, being an extension of the successful pre-war SS90 & SS100. They asked themselves "What if SS100 production had not been interrupted by the War, and Lyons further developed the SS90/SS100 series on the SS100 or Mk V chassis? Perhaps, Lyons might have evolved an ‘SS120’ eight years earlier than the XK120." Finch are therefore doing just that and are building a ‘what-if’ car; being a SS100 variant based upon a Mark V, and they can offer a range of coupe and convertible styles. The first model being scheduled for release at this year's upcoming Adelaide Motorsport Festival. The person who travelled the furthest for the visit was Gary Stephenson's brother-in-law Dave Rothwell, who was over from the UK. Dave is in fact the manager of Moss Motor's UK so was professionally interested in the restoration works being undertaken. 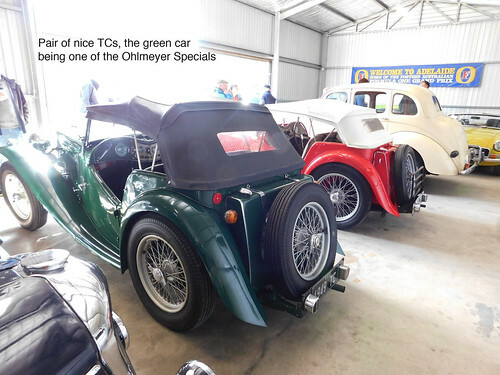 I would recommend that you visit their web-site for a full list of their services plus a detailed catalogue of vehicles that they have worked on over the years. They even have a section dedicated to MGs, so it was great to have Maurice Linehan's newly acquired TD along as this had been the subject of a ground up restoration by Finch. We must have been fairly well behaved as Peter & Harbinda have in fact extended a further invite to the Club and to all MG Registers. Their details are on their website www.finchrestorations.com.au, or I would be happy to put you in touch with them. Due to the efforts of Wendy Sauer, the MGCCSA were invited by the Victor Harbor Council and the Ocean Street Committee to arrange a display of MGs as a part of their "International Coffee Day" celebrations. So our thanks to Wendy in helping promote the Club. This was a town event which included an artisan market, art display and workshops, buskers, shopping and of course a coffee competition to find the best place in town. Plus we had a visit from the Steam Ranger and second steam loco. 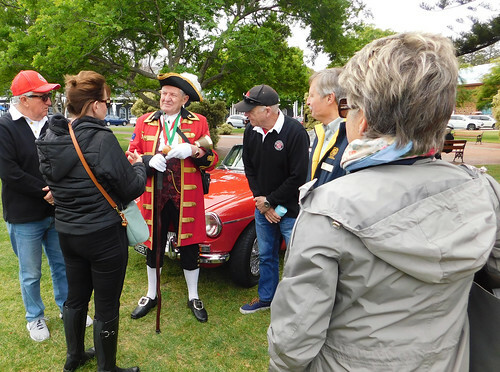 Although the day was cold and overcast it remained dry and our cars did attract a lot of public interest, including one from the Victor Harbor "Town Crier", a local volunteer who promotes tourism. 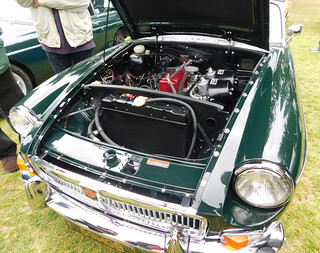 Organised through the MGB Register, a total of 31 various MGs were displayed in the centre of town on Warland Reserve. This display included not only MGCC members but also fellow MG owners invited from the Victor Harbor "Historic Motor Vehicles Club", with whom we have participated with at various events over the years, plus some local MG owners who are yet to join any car club but who were hopefully inspired by the day. Apologies to any who did not get to record their attendance. MGB Register Event, Beach Run, Saturday 18th February 2017, by Steve Spong. The plan was for a balmy summers evening drive along the coast from Brighton to Largs Pier, however our weird summer weather had different ideas. It did not rain but it was overcast and chilly. However for the select few who made the run it was a great evening. We welcomed back Roger Ford, who has been off convalescing after a nasty ladder fall, and admired his recently re-sprayed Camino Gold "B". It was also great to meet the newcomers to the club out for their first event, namely Daniel Cooper & Cheryl Andrews-Cooper and David & June Hill in their lovely "Bs". We managed to keep, more or less, in convoy for the whole of the route but the actions of some drivers do make you wonder, and what is it about roundabouts that people do not understand? At the Anzac Highway roundabout in Glenelg, we were all continuing straight ahead when a lady cut in from the left, across the bows of Leigh and Judy, and shot off to make a right hand exit. All with unrestrained kids flying about in the back. Luckily Leigh managed to take the necessary evasive action but it was a close thing. Anyway the rest of the drive was uneventful and we arrived at Largs where some had to return home, only coming for the drive, whilst 6 of us headed for the pub for a meal and a very congenial night. So thanks to all who came and we look forward to seeing everyone and more at the next B Register Event, yet to be advertised. It was a perfect summer's day for a drive in the MGs, as witnessed by the good turn out. Welcome too to the first timers on a club run. The run through the Hills was terrific and the towns like Stirling and Aldgate were all a buzz preparing for Christmas, plus there were a few classic and sports cars out like us. First stop was Strathalbyn for a stroll around and to grab a bit of a light lunch. Unfortunately Jim & Joan Hanna had to return home due to a broken exhaust pipe. Then it was on to Milang and the Railway Museum where we had been invited for the afternoon. The museum is run by volunteers and they are all very motivated and enthusiastic about their exhibits and they are always planning future improvements. We received a very warm welcome, the volunteers being very pleased with the turnout and the delicious home baked afternoon scones were huge! The museum is well worth a look in if you are in the area, entry is free but they do hope for a small donation. On Friday 16th September we held an MGB Register meeting at the clubrooms as a part of the weekly "Noggin 'n' Natter". There was a reasonable turn out of faces, both B and non B owners, but there were only 4 MGs in the car park. This was all hardly surprising however given the recent lousy weather and night temperatures. Particular thanks go to the Cardnell's for their support and contribution with the food, especially given they had held the MGA** register meet at their place only the night before, so they must have been "registered out" by the end of the night. During the evening we showed a UK documentary entitled "MG-The Legend", which was followed by the last quarter of the Bulldogs / Hawks finals thrashing. So thanks to all the die-hards who came and supported the evening. Looking ahead to the next event, this will be in December and will be a car run, so stay tuned. PS: there is an interesting article in the October 2016 edition of "Classic and Sports Car" which compares the MGA Twin Cam very favourably with the Porsche 356B, Alfa Giulietta Sprint and Lotus Elite. 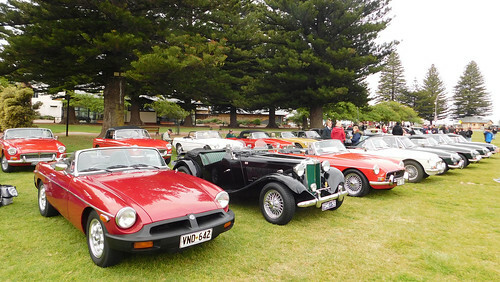 The MGB Register held a run from Victoria Park to Goolwa and to Michael Finniss's Motor Museum. There was a good turn out of "B's" plus one foreign type, and whilst a bit chilly the weather was ideal for a winter's run, roof or no roof. Upon arrival in Goolwa we all grabbed a bit of lunch, with people mostly making use of the good bakeries and some hot coffee. It was then off to the museum. Those of you who know Michael will know him as a bit of a character, and he did not disappoint nor fail to regale us with stories on life, on cars and on racing. As you may know, John Roach has recently bought a Camino Gold "B" which he has fettled and done up, so what greeted us as we walked into the museum? nothing less than a large photo of John's car as it was once owned by Michael. So there was much discussion of its history and of looking under the bonnet. So thanks to Michael for his hospitality, and thanks to all who supported the day enjoying a great run through the quiet Adelaide Hills and Fleurieu. The Museum is well worth a look if you are in the area , and boasts some 45 cars ranging from the 20's to the 70's and Michael will make you very welcome. The museum opens Wednesdays to Saturdays inclusive and the cost is $8.00 a head, it is located at 45 Gardiner Street, Goolwa (08 8555 3338). It is well sign posted from the main road to Victor Harbor. Michael Finnis has kindly agreed that we visit his Goolwa Museum, entry fee only $8.00. Assemble to leave at 10.30am so allowing time for a bite to eat in Goolwa before visiting the museum. 12th March 2016 By Steve Spong at Mount Lofty Botanic Gardens. Many thanks to all those club members both regulars and newbies, and their friends, who came along to the MGB Register Meet at the Mount Lofty Botanic Gardens on Saturday 12th March. Thanks too to Allan and Raelene for going out of their way to call in on their way to a family gathering. Congratulations also to Dean and Ann Hosking for winning the spot wine raffle, although this could not be enjoyed in the gardens. As usual the cars made a great display in the car park and attracted the interest of the other park visitors. Following the record week of high humidity, it was pleasant to sit by the lake in the shade of the trees and enjoy the changing colours of early autumn. After a lengthy sit and chat over a light lunch we set off for a stroll around the lake and to wander the many pathways. To help educate us all in the ways of such things non mechanical, many thanks go to Geraldine who distributed some guided self walk sheets which gave not only a great overview of the gardens, but information on the various trees and plants plus advice as to the best outlooks and what to look for. The consensus was that these periodic "B" Register events should be continued, with the preference for a combined run to a suitable destination, and this will be the format for the proposed Saturday afternoon get together in June, venue yet to be decided. Remember all are welcome and thanks to the non "B" attendees noted below. If you have not been to these Botanic Gardens for a while then it is well worth the pleasant drive through the Hills to spend some time just sitting or wandering around any of the multitude of pathways through the various garden zones. It is BYO everything however. Over the past months the gardens have seen many improvements in their facilities such as a the addition of a great viewing pavilion. The recently installed series of interesting modern sculptures set around the lake walk were great and proved to be the subject of much discussion and enjoyment and photo ops. These sculptures all being very much in keeping with the theme of the gardens and the natural environment. The Club is trying to establish a comprehensive register and data base of all the current financial MGBs and RV8s within the club and seek your assistance in trying to develop this. * Any points of interest in regards to the car's specification or its history. Production commenced on the 28th May 1962, prior to the car's official launch on the 20th September 1962. The first 500 examples were destined for the USA. In total 512,243 MGBs (both Roadster and GT) were manufactured. ie: 387,259 Roadsters and 124,984 GT's. The last car came off the production line on the 22nd of October 1980, some ten years later than initially envisaged. The first production MGB was Iris Blue being Chassis No. 101. A basic MGB cost just under £95O, but this one had the added extras of wire wheels and a heater. The last production MGB was Bronze Metallic being Chassis No.532001. It was one of the 1000 'run-out' LE models which retailed for £6108 Both cars were roadsters. MGBs were initially only available in 5 colours..
British Racing Green was introduced 3 months into production. MG's 250,000th "B" was a GT and was built on the 27th May 1971 to US Specification. It was given away free as the prize in a competition run through USA dealers. Berlinette MGB 1800. In January 1964, the "Berlinette MGB 1800" was shown at the Brussels Motor Show. This stylish car was a fast back version of the "B" produced by Jacques Coune of Brussels. In total 58 were built. It is about a Pininfarina bodied prototype, coded EX234, with hydrolastic suspension and developed in 1965 and which still exists having recently been auctioned by Bonhams for £63,100 (AU$ 110,158) including premium. Destined originally for greater things, this car had only a 1275cc "A-Series" engine, but for all that it seems to go Ok.
MG introduced the "BGT", styled by Pininfarina in 1965. MGC production (Roadster and GT) ran from 1967 to 1969. Total Number of MGCs built was 9002, with Roadsters and GTs in almost equal numbers, ie: 4544 Roadsters and 4458 GT's. 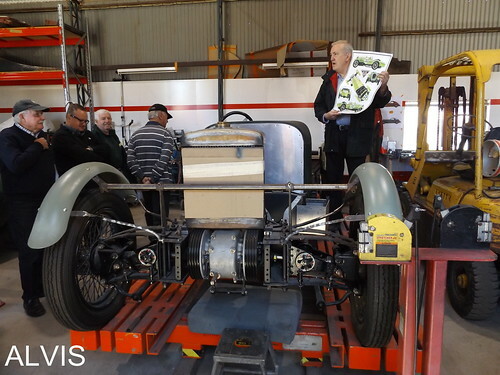 MG Abingdon successfully trialled the Australian BMC 6 cylinder engine for the "C". This engine was as used in the Australian Austin Freeway and Wolseley 24/80. Known as the "Blue Streak" at 2433cc it was developed from the "B" series engine and was in fact considerably lighter than the final "C" Series engine, but shipment costs made the option prohibitive. MGB RV8 production ran from 1992 to 1996. Total Number of MGB RV8's built = 1982 All were right hand drive as Rover did not want to incur the development costs to meet USA safety legislation. Similarly the initial design for an independent rear suspension system for the car were cancelled due to costs. As such most cars were exported to Japan, and had air-conditioning fitted. The most common colour is Woodcote green. We could all in fact have been driving an Aston Martin. Aston Martin looked to salvage the remnants of MG after British Leyland announced its intention to close MG in September 1979. Aston Martin Lagonda believed that MG could compliment its business mix and so sourced a 1980 MGB in order to demonstrate its ideas for the car. * installing the 4 cylinder, aluminium head, belt driven over head cam BL “O” Series engine as developed from the “B” Series and fused in the 1978 Morris Marina and later other Leyland’s and by Rover. This engine also being trialled by MG for the "B"
* The car was then painted “Silver Sand”. The actual car still exists in the UK. Aston Martin Lagonda even had a “stage 2” planned for the car's development. Utilizing the “B”s floor pan and sills a sleek new roadster, a hard top and even a 2+2 were considered for release around late 1983. Alas the whole deal fell through. Arguably the most valuable and hence most expensive MGB would be the sole remaining Works Le-Mans Race Car. Built for the 1965 race, the alloy bodied car (in red car with a white coupe roof), registered "DRX 255C" it is still campaigned in the UK. A price tag of around $500,000 has been estimated. ...... any other trivia or useless facts about the MGB or its cousins would be appreciated. Previous Owners: Unknown seller to Octagon Motors around 1985. Colour: Red Original colour was white, with the restoration and colour change in the mid 90's.